What is Your Level of Maturity? Tribal Power is the Group Mindset and we all begin our journey here. Family, society, religion, political parties, cultural standards are all forms of group thought. The beliefs we have about people who are like “us”, and “them”, those different from us, are all formed in our growing up years. When you are living on the Tribal Power level you are literally thinking, acting, working and moving at the speed of a group and your sense of power moves at the speed of the group. You run your ideas past a group of people for empowerment and approval. The group determines who you can /cannot love/marry. The group determines what clothes you wear, what actions are acceptable, what is good/bad, right/wrong. When you step out the door, do you think it’s just you? No. It’s the whole tribe. You ask yourself, “How should I look, act speak, believe . . .” The Tribe determines. Forgiveness is not in the Tribal Code. Vengeance, being right and honor is. Individual Power reflects on the self and at some point sits up and realizes that “I” have something to do with the results in my life and in the world around me. When you are on the level of Individual Power, you recognize the responsibility you have for the quality of thought forms you have in your head and the consequences of those attitudes, judgments and beliefs. You willingly take accountability for your actions, reactions, inactions and results. Spiritual Power is a Life Force removed from the Ego. When you are on this level, you separate yourself from yourself so you can observe yourself and learn from what you experience without feeling threatened or defensive. You see everything as being a part of a magnificent spiritual design which is much bigger than you and yet you realize that you, too, are that spiritual design. You realize the power of thought and how it can refuel your body with health and well being or deplete it with sickness and pain. You realize you create your own reality and that what you generate externally affects you internally and what you focus on internally manifests itself externally. You understand we are here to learn how to manage our spirit, to learn how to become effective human beings, to be more interested in life working than in being right, to find workable solutions for everyone, to learn how to generate love not hate, how to build connection not separation. . . how to focus on our similarities, not our differences. You can’t enter new levels of Spiritual Power/Evolved Awareness without preparation, just as you can’t be expected to fly a high powered jet when all you’ve flown is a helicopter. It takes a commitment to continuously practice consciousness. Symbols of Spiritual Power are available to us all the time. We are constantly being given opportunities to grow, learn and expand our awareness. But we only see these signs/symbols occasionally because we don’t have the capacity to see them all the time. 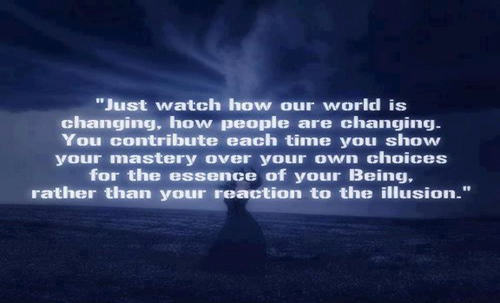 As we grow, so does our consciousness and our capacity to “see”. When you are approached by the Universe/God/Spiritual Power, the only thing you have to answer is, “How much madness/fear do I have to go through before I will say, yes?” How much do you have to endure before you surrender and trust the process and trust that everything that enters your life is a gift there to support you to evolve spiritually? Consciousness changes the speed of things. When we are aligned with Spiritual Power, life works and miracles happen, which is what terrifies us, which is why healing terrifies us, forgiveness terrifies us and why enlightenment terrifies us. Because when we realize the choice to actualize what we want in our lives is in our hands, the possibility is almost overwhelming. It is unfamiliar. We are so used to making things difficult and hard, the very thought it could be easy is frightening. Perhaps one of the two most important questions we can ask is, “What is consciousness?” The juvenile answer is peace, harmony, joy, etc., the things we all want in our lives. But that is not consciousness. Consciousness is a willingness to let go, a willingness to change. The only way you can raise your consciousness to new levels of Spiritual Power is to be willing to let your life change.